Sewing handbag advise – lessons learned the hard way! I might not be remembering the specifics of what got me started making these bags and not sure why I didn’t attend, but think Markita was holding a Handbag NG suggesting this pattern (free download). 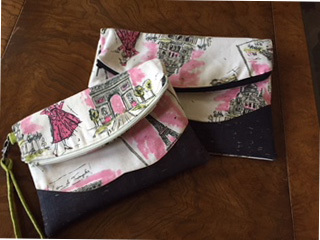 The bags appealed to me and I wanted to try sewing with cork so thought these might be a good introduction to purse making along with cork sewing. As usual several months went by before I did anything but started with the smaller one first and followed the instructions to the letter. I used all the suggested interfacing and although I like the bag, was not happy with how it turned out. First the thick interfacing was too much (in my opinion) for this small clutch. And I never thought through the cork – what a pain turning inside out! Of course several more months went by and I forgot some of what I had learned the first time around. (Take notes? Never! I’m too “smart” for that! NOT!) So I still didn’t learn that lesson with the larger clutch! Thick interfacing was not used and I only put the cork on the front. Still it was very hard to get a crisp corner. But I do like this clutch better since it’s not so thick. Sample with the interfacings, linings and fabric. I used a decorator fabric which is so much thicker and sturdier than quilting cotton, therefore, my first clutch was too spongy for my taste. Sample with the cork, vinyl or if using leather. Rounded corners look so much better! Interfacings: TEST!!! with some interface/fabric combinations either the fabric or the interfacing shrinks causing bubbles. One way around this is to fuse the interfacing to a piece of muslin instead of the fashion fabric. Just then treat the two layers as one. In most bags I use either Annie’s soft and stable or Pellon Flex Foam. One advantage of Annie’s brand is that it comes in black and cream. I always trim away this stabilizer from the seam allowance just as close as I can to the stitching line. Other stabilizers: I use dollar store cutting boards for the bottom of my bags. I have used a product from Tandy in the past, but actually I like the plastic cutting boards better. They are thin enough to cut with a rotary cutter. Seams and temporary holder s: Sewing bags means you have a thick fabric (or leather or cork) a lining and interfacing. Pining just doesn’t work, it would damage the leather and cork and it is just too thick. Use strong clips! 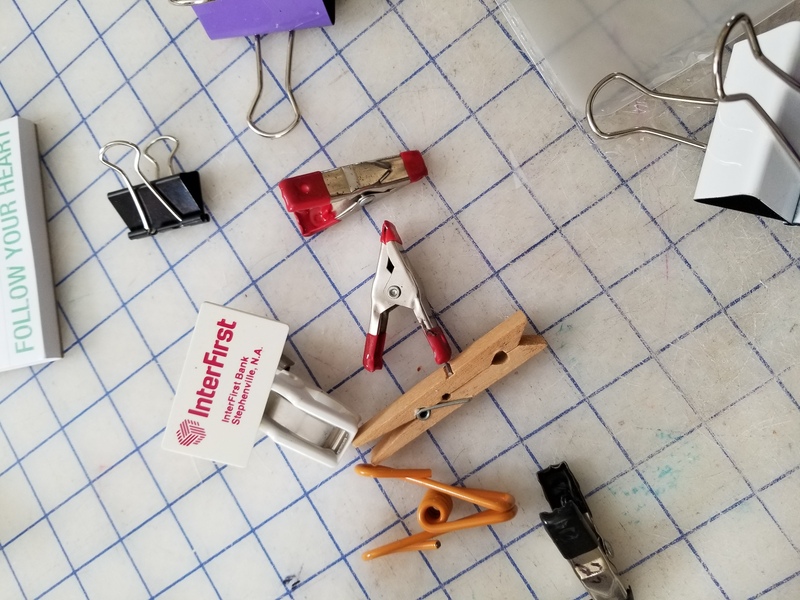 My favorite ones I actually bought at a hardware store (the red and black ones) but I have used office supply clips (from the dollar store) chip clips, wonder clips. What ever you can find – just not pins. For leather I also use leather glue and clips. You also cannot iron cork or leather. Press your seam open with a seam roller (like for wallpaper) and when you are finished with the seam, I use two sided sticky leather tape to hold down the seam allowance. You can get it from wawak.com. It comes in 2 widths. Next Next post: 2018 ASG Plano Sewing Retreat!